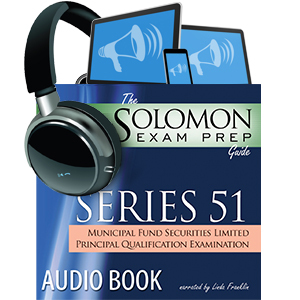 This 4.4-hour audio recording of "The Solomon Exam Prep Guide to the Series 51" will give you the content of this invaluable and enjoyable study guide in an audio format. After hearing the book’s well-written content, you will be even more prepared to tackle the Series 52 exam with confidence! The Series 51 audiobook is a great companion to the Series 51 Online Exam Simulator, the industry-leading online testing program that ensures you are learning and retaining the information. Big thanks to Jeremy Solomon and Solomon Exam Prep w/o whose practice exams & books the Series 79 and Series 63 would be a suicide mission or death by boredom!